I called myself an "audio enthusiast", but have been into audio since my high school days in the 1960's. I've had Warfdales, Infinity, Klipsh, Advent (large 2 pairs), and more. I have worked in 1960's "Hi-Fi" stores in the Midwest years ago and auditioned all brands of speakers, preamps, amps, and audio receivers. But I don't presume to be an audiophile as there always seems to be someone more nuts about audio than me :). That being said, these B&W 602 S3 speakers provide the most natural and solid sound presentation in any listening room up to 400 square feet or more that I've had. I have a diverse music interest on both vinyl and CDs. Everything from John Williams and Eric Kunzel on Telarc, Narada and Windham Hill, '50's through '90s rock and pop, jazz orignals, Frank, Tony, Dean and more. These speakers are classics and I would be hard pressed to part with them unless I could audition another model or brand using my own equipment. I've driven them with my venerable Phase Linear 700B/2000 combination and currently am using them with a Boston AVR7120 for both music listening and home theater. These speakers offer astounding clarity and presence for music and thunderous realism for today's DVD soundtracks. The warmth and smoothness when playing an LP on my Dual 1229/Audio Technica AT15SA combo are just a pleasure to percieve. And Gerald Albright "Live At Birdland" is like being there on CD. I also own a pair of B&W 640's and while those speakers have their place (mostly in larger listening rooms, such as my lower level family room), the DM603s are my favorites. I picked these up from an estate sale and they had been in a little used library/den since new. They were a bit dusty, but in pristine condition after a gentle dusting with a soft paint brush and vacuum. If you are fortunate enough to find these gems, by all means, don't pass them up! I picked these up from an estate sale and they had been in a little used library/den since new. They were a bit dusty, but pristine after a gentle brushing with soft paint brush and vacuum. If you are fortunate enough to find these gems, by all means, don't pass them up! Range, quality, performance, Nautilus Tweeters, price and value. Only the quality of your equipment. I bought these wonders knowing they had issues. I replaced the tweeters and crossovers for a total of $180.00 from B&W with a total of $560.00 invested. I have got to say this is one of the best investments I have ever made. For those who say the low end is lacking, I can only say they just don't have equipment that can make hese puppies sing. I am an anolog kind of guy, using a Thorens TD320 turntable with pristine vinyl using an Audio Technica 152 LP cart, a McIntosh C 28 Preamp, a McIntosh MC2100 amp and, my reviewing wonders the B&W 603 S2 speakers. WOW!! The lows thump with accuracy and produce a sound only live performance can rival. The mids are smooth, silky and lifelike. The highs, what can I say, the Nautilus tweeters are the most accurate at this price range that money can buy, period!! What a deal!! I have listened to everything from classical, jazz, blues, new age to rock and they reproduce the sound accurately and lifelike. My recommmendation is... if they don't sound great for you, it's your equipment you are using, not the speakers! It would cost much more in other brands to even closely rival the performance of the B&W 603 S2 speakers. Great!! The local dealer was very helpful and any parts I needed were in stock, shipped and available within 3 to 5 business days. Sound, build,good looking, tight but impressive bass, no need for subwoofer. These speakers are great. I use them on a CA azur 540a and they sound fantastic. Lot's of power and never that irritating bass you hear in many speakers. The highs are very pleasing to the ear. These speakers can fill the room with music and you can still have a conversation. Very clean bass, great highs, very musical and lifelike. Great looks. Let me first tell you how lucky I was. I went to a local U.S Marshal seized equipment auction. I picked up 4 of these speakers for $880! Practically brand spankin new! I am keeping one pair and selling the other. I will be able to sell the second pair for what I paid for both! Now for the review. I had a pair of Pinnacle CGT's which I have also written a review for. I love the CGT's, but something was missing. They are very strong sounding speakers, and have tremendous bass. But the highs just weren't bright enough. I found what I was missing with these B&W's. I have spent hours listening to the CGT's, then the B&W's trying to decide which to keep. The B&W's are smoother and have better imaging. The vocals on the CGT's tend to really jump out at you at high volumes. The B&W's are much more musical. I will now sell my Pinnacle widescreen center and rears to get all B&W. I am currently using a Kenwood KM-X1 amplifier while my Denon AVR-5600 is being repaired (I bought it on ebay not working). Can be revealing and unforgiving with bad recordings. An excellent all around performer. Will stun you with the depth of it's soundstage. Pours honey out of them nautilus tweeters. Amazingly transparent midrange, tight and deep bass that never goes out of control. I bought these used and I am definitely happy. I made a 2000 dollar deal, though it only cost me some 400 bucks!! Some el cheapo mordaunt short with muddy bass, yuck! Good build quality. Solid and controlled bass and midrange. Annoying high frequency "tizz" for those whose ears stretch that far. The B&W 603s are well finished cosmetically and will blend into any room. In terms of audio quality, at first listening the speakers are warm, with a solid well controlled bass. Soon howver the "tizzy" top end makes its presence felt. For those whose ears have started to lose frequencies above 12KHz this may not be a problem, but in my case, once noticed the tizz was ever present. It is almost as if the tweeter cannot accurately follow the higher frequencies and instead reproduces a distorted or clipped waveform which fails to follow the music. Whilst speaker reviews are generally a matter of personal taste, of preferred tonal balance, or tradeoff between warmth and clarity, this is not the case with these B&Ws. The top end simply does not work. I am not able to observe or hear any weaknesses with this speaker. I was looking at the 604 and 605, which is the same speaker with an extra driver. I don't know that I would have been any happier. You'll find that these speakers will offer more than you could ever use or bear to listen to. I gave it 3 stars for value because it was a fair deal, and that's what 3 stars means. I spent a little more than if I would have purchased used Paradigms, for example, but I wanted to pay more to get a better speaker. If you're looking for a bargain - I think this speaker is a fair price, but it's no secret that you pay a little more for B&W, but that's okay - it's a little more of a speaker. I looked at various speakers - Klipsch, Paradigm, and B&W. I spent much time researching the specs. on the various speakers. My musical tastes include classical, jazz, and rock. I was looking for a speaker with clarity in the mid and high frequencies, and I was looking for a deep and punchy bass in the lower frequencies. I mostly use my system (Adcom amp/preamp/tuner, Sony CD/DVD) for music. However, I will use it when playing a DVD. These speakers are phenomenal. I have seen some reviews suggesting that they may not have enough bass at low volume/impedance. I completely disagree. If you listen to classical, you will think that there is a violinst or an orchestra in your room (Nautilus tweeters are a big plus!). If you play jazz or something like Sade or Anita Baker, you'll love the smooth, deep, rich tones and the punch of the bass. If you listen to Nirvana or Pearl Jam or POD, you'll still love these speakers. I did not use the foam plugs, and I will be experimenting with bi-wiring and different cables. For now, they already sound perfect. When I have the volume knob only turned to 7:00 or 8:00, you lose no sound. I immediately noticed that even if the volume is low, and you may not think the lower frequencies are overly loud or boxy, you can literally feel the bass punch in the floor and even in the air. I believe that some of this is a product of my amp. However, shame on you if you buy these speakers and use a cheap amp with them. In my case, the combo of these speakers and the Adcom amp is wonderful. This is my first pair of B&W's (purchased to replace old Acoustic Research LST2's). I will not buy another brand of speaker. 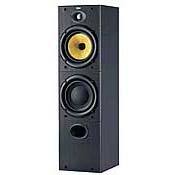 The Paradigm Monitor 11's were a respectable speaker, but the B&W's were better, I believe, or at least different. I am now hearing instruments that I never knew were present in various CD's. When I play a DVD, I still find the speakers more than adequate even without a subwoofer. I will end my rambling at this point, but I would highly recommend these speakers to anybody. Make sure you have a good amp so that you fully realize the speaker's potential. Otherwise, it would be akin to putting regular unleaded gas in a Porsche 911 or buying tires for the car from Pep Boys.